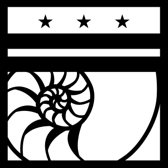 Join us this Saturday, June 9 at 1:30pm for a planning meeting for a new HacDC study group focused on beginning to intermediate linux admin skills. We’ll get some study tips from HacDC’s own Brian Harrington (proving that a giant beard makes a better linux admin!) and discuss the future meeting schedule. Sign up for the meetup event so we’ll know to see you there. We’ll also discuss the Redhat certification objectives for the RHCSA and RHCE that we’ll be following as a framework. 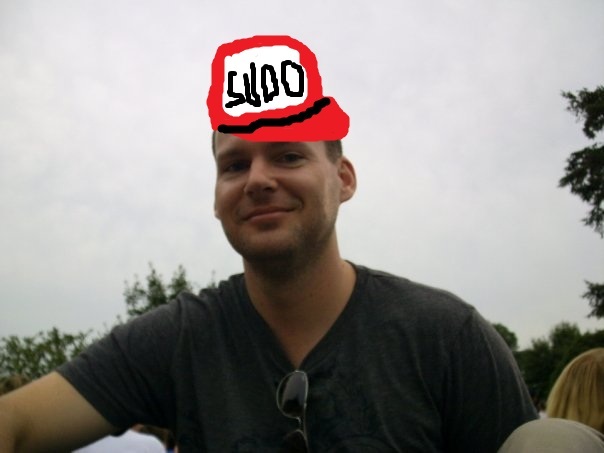 That said, it’s not necessary to be pursuing certification (or even to be using a redhat based distro) to attend the study group. Prerequisites for the study group are any linux distro installed (CentOS 6 or Scientific Linux 6 for redhat cert) and ability to access a shell prompt. 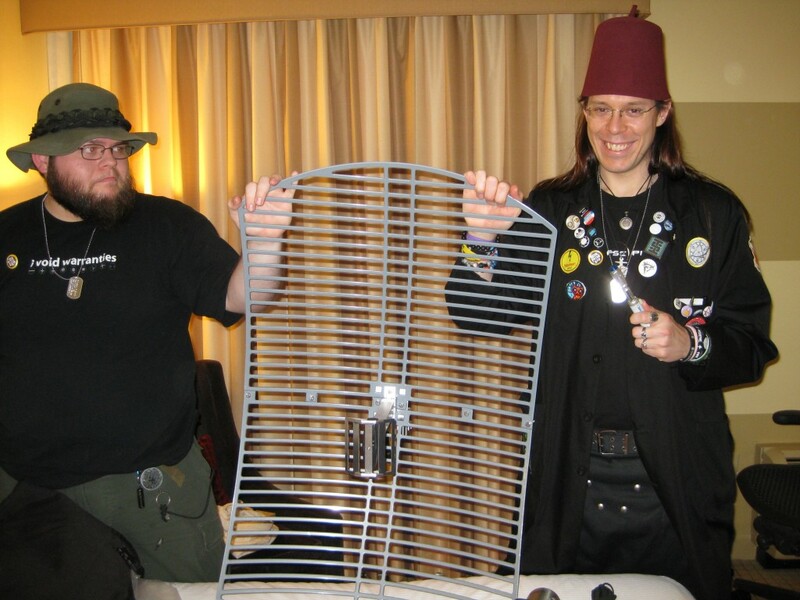 You can learn more about Project Byzantium and mesh betworking by attending the HARC (HacDC Amateur Radio Club) meeting Wednesday, June 13 at 7:30pm. More details here. We are excited to announce that HacDC joined Mount Pleasant’s neighborhood mesh network! 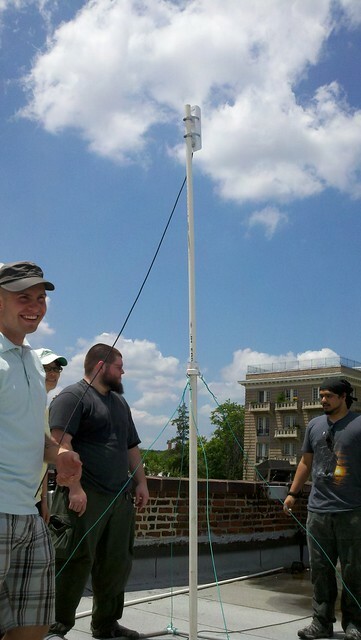 HacDC member Haxwithaxe put the finishing touches on the mast he designed and built for the router, and Preston Rhea and other OTI engineers upgraded our router to the latest copy of their Commotion firmware. Then we all went up to roof where we mounted the router and strung the Cat-5 to power it. Unfortunately, we are not in range of any of the other nodes (yet). We just don’t have a good line-of-sight to any of the other nodes in the network (yet). However there’s a good chance that one of the intermediate buildings will install a node which will serve to bridge us over to the rest of the Mt Pleasant network. Thanks to the HacDC members, friends in the community, OTI engineers, and everyone else who helped make this happen! 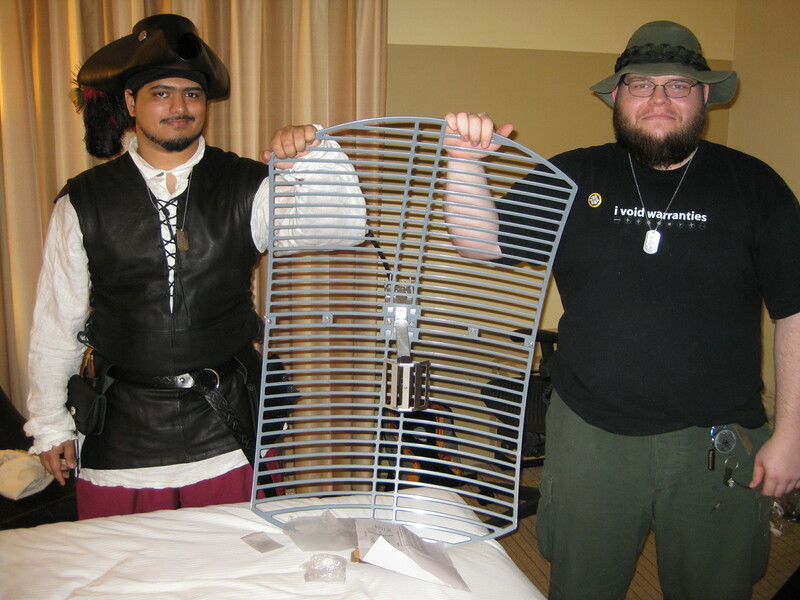 Recently, HacDC members The Doctor, Ben the Pyrate, and Haxwithaxe went to CarolinaCon in Raleigh, NC to present on Project Byzantium. The guys had a great time. “CarolinaCon is freaking awesome,” said Haxwithaxe, noting that Raleigh has a local computer chain store that sells 1m wide parabolic antennas for around $50. In the below pictures you can see two different combinations of the Project Byzantium speakers holding their parabolic antenna. possibly apply to the Broadband Bridge mesh node project at HacDC. Schemers is a study group for those interested in exploring Structure and Interpretations of Computer Programming (SICP), an introductory Computer Science textbook used by MIT. Not only is the entire textbook available online for free, but it has some rather zealous fanboys and fangirls. Our study group will be going through the book and meeting every other Tuesday at 7:30pm starting next week Tuesday, May 22. For the first meeting, we will be setting up testing environments and discussing Section 1.1. You should read the section and take a stab at the exercises before the meeting. Check out the Meetup event for more details and to sign up!